Hov Gård is situated in beautiful surroundings at Hov on the island of Gimsøy, between a wonderful arctic white beach with view on the ocean and the mountain Hoven, on the north side of the Lofoten Islands. Restaurant Låven offers tasty local food and the farm also offer riding tours with “Viking horses” all year round on trails used by Vikings 1000 years ago. Join us for a riding tour under the Midnight Sun in summer or under the Northern Lights in winter. We offer longer and shorter tours, both for beginners and tours for experienced riders. Group tours, private tours and multiple day tours. We have at the moment 50 Icelandic horses and 6 to 10 guides that work full time at the farm. Our restaurant Låven, a rustic and beautifully restored old hay barn, seats up to 80 people. We serve tasty dishes based on old recepies from the farm, made from Lofoten’s unique and fresh ingredients. Låven is well suited for meetings, workshops and conferences with its modern facilities. The location beside a white beach, the Midnight Sun and Northern Lights has already made it very populare for Northern Lights events, weddings, lunches and dinners for the groups and individual travellers. At Hov Gård you also find Hov Camping, a populare campground suited just beside the white Beach at Hov. It Hov camping is situated by a beautiful white sandy beach with views over the sea to the North and the midnight sun. We have parking spaces both with and without electricity and a service house with kitchen, showers and toilets. Beautiful and nice horses! A tour in extremely beautiful surroundings. A top experience in nature. Thanks for the ride! Hov is one of the oldest places in Lofoten, and historical monuments from ancient times have been found here. These include landing places for boats, a heathen temple, and Viking Age graves. We believe that the residence of Viking chieftain Tore Hjort was located here over 1000 years ago. He is mentioned in the Viking sagas and was killed by King Olav Tryggvasson during the Christianization of Norway. 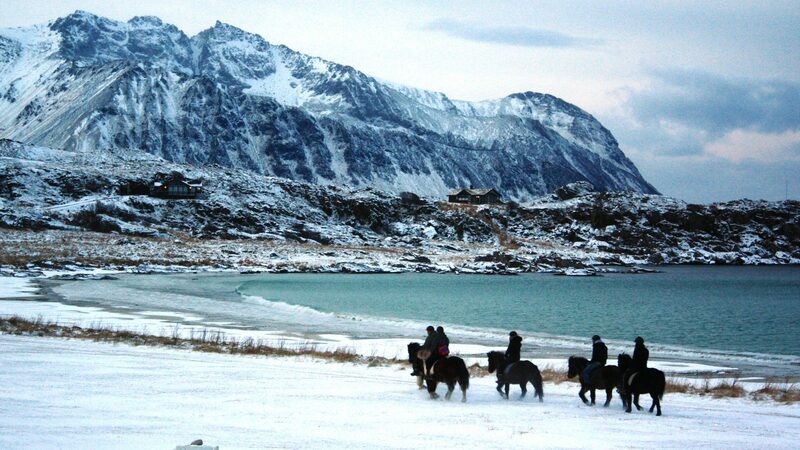 You will hear the story of Tore Hjort, amongst others, when you join one of our guided horse riding trips.